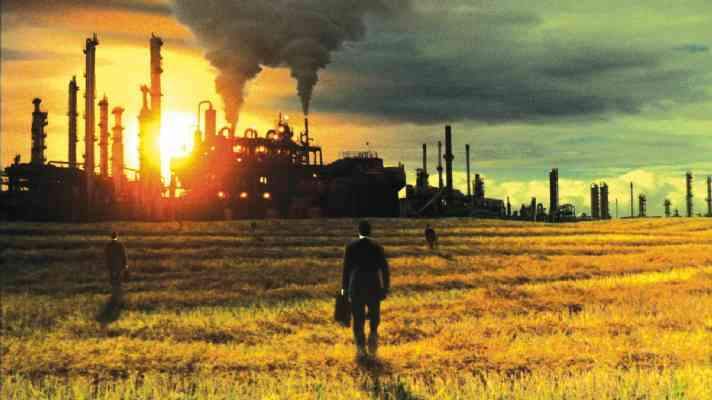 Businessmen cross a field in a stylized scene from “Food, Inc.,” a Magnolia Pictures release. The film strives to lift the veil on our nation’s mechanized food industry. Anyone who eats should see the film "Food, Inc." But here's a tip: Have a meal before you go, because you may not be hungry afterward.There are several disturbing images of industrial food production that may shock viewers, including chickens that can't walk because of breast-enhancing "engineering," a downer cow being shoved around by a forklift and pale globs of ammonia-treated beef "filler" tumbling through a maze of factory chutes. The yuck is used to yank the veil from consumers' eyes. The film takes the viewer from seed to table, and it's a wild ride of politics, health care, worker's rights, poverty vs. enormous wealth and justice, or the lack thereof. The Herald screened "Food, Inc.," which is now playing at the Abbey Theatre through Aug. 6, for a panel of local food professionals and experts on Monday. We asked what they thought of the film and how it connected to our local food culture. The group included: Darrin Parmenter, director of La Plata County CSU Extension Office; Holly Zink, owner of Sunnyside Farms Market in Durango; Jesse Villanueba, butcher at Sunnyside Farms Market; Jerry Zink, owner of Sunnyside Meats processing plant; Amita Nathwani, an ayurvedic practitioner with Ayurveda Center of Durango; and Wendy Rice, Family and Consumer Science Education agent with the Extension office. Jim Dyer, director of Durango's Farm to School program, prescreened the film and sent his comments via e-mail. Dyer: The main message for me of this film and of its apparent inspiration, Omnivore's Dilemma, by Michael Pollan, was that of control - currently resting with corporate giants in bed with regulators. But what if we started taking control of our food system, as individuals and communities, starting with the choices we make three times a day?Parmenter: There's nothing that prohibits the people in our community from making choices about food; if it's planting your own garden, if it's the school districts purchasing healthy and local food, if it's a humane slaughter. These things are going on in our community, and I feel blessed that we have these opportunities. Food costs money, but there's a perception that it should only be a small part of our budgets. I made a commitment that food be a major part of my family budget. It's expensive, but I'm willing to pay for it for myself and my wife and kids. The film really brings up that we have to make the policy changes related to food. We have to make carrots cheaper than junk food. Herald: It's illuminating in the film when Joel Salatin of Polyface Farms says, "Why do people think food should be cheap? You wouldn't buy the cheapest car." Holly Zink: When we choose less expensive foods, we are still paying as taxpayers, but it's coming from government subsidies. So even if the food is cheap, you're still paying the full cost of the food. Dyer: We won't get far if we don't confront our nation's "cheap food policy," an attitude that most of us, perhaps unthinkingly, share. Without fair prices for all farmers and fair prices for all consumers, which both requires and helps create fair wages for all, we can't move from an industrial food system back to a biological one. Nathwani: If you're eating GMOs (genetically modified foods), the quality of the food changes, and it creates imbalance in the body. With a more natural, whole-foods diet, even if we are faced with pathogens the body still will be able to fight them or adapt to them. Rice: A lot of it comes down to individual responsibility. We can't wait for someone else to fix the problem. We can put a very decent meal on the table for $11.50 (unlike the Orozcos, shown in the photo above, a family that purchased a large fast-food meal for this price). Education about food is the key. That's one of the many blessings in our community: We are aware, and we have options. Herald: Does anyone have thoughts on the shock value of the film? Dyer: The ugliness of parts of our industrial food system make this film almost too hard to watch, and by hiding from the ugliness - by not asking, by not looking, by not insisting on the right to know - we play right into the hands of those whose interest it is to keep the ugliness out of view. What if we insisted that all farms and ranches be places we would feel free to take our children - where they would be safe and see the beauty of our coexistence with the domestic plants and animals that feed us? Farm to School, which promotes knowing where your food comes from, is a tool that could help move this approach forward: Kid-friendly farms! Redford: It was really, really disturbing to see how animals are treated and slaughtered on industrial farms. And it just broke my heart to see chickens that couldn't stand up. Nathwani: I liked the two perspectives of the different producers: the one farmer (Polyface grower Joel Salatin) who said he didn't want to expand, and the Stonyfield Farm CEO who chose to market his products with Wal-Mart's new organic line. That makes viewers say, what are we really going to support here? Do we want to support that kind of mass marketing or stick to the smaller growers and farmers markets? Jerry Zink: The film didn't answer the question of what happens when big corporations buy up organic processors. They didn't say whether it had an effect on their products or business practices. They left it open. Herald: What did you think of the depiction of the FDA and USDA as being passive, and not doing a good job of protecting the nation's health? Was it fair? Jerry Zink: It wasn't entirely fair. I have one or two inspectors in my plant five days a week, and they are very diligent. But there's a difference between plants that process 80 cows a minute to one that processes eight cows a day. Herald: Was there anything in the film that surprised you? Villanueba: The fact that Smithfield (a hog processing plant in Tar Heel, N.C.) has an agreement with the authorities to run immigration raids, but they're only allowed to take 15 people per day so it doesn't affect the production, that really struck home for me. As a meat-cutter in a non-industrial setting, it's really scary to see how dangerous those jobs can be. I'm paid very well for the job that I do, and for (Smithfield workers) to be paid just above the minimum wage, it's downright shocking. Amita: Anyone who is interested in their own health, the health of their family, weight loss, athletic performance - anyone in this community can really benefit from watching this, because it can open your eyes to where we want to prioritize our lives. Without this kind of education, we don't get the opportunity to choose that. We live in the dark. Holly Zink: I was horrified by the scene in the grocery store with (the Orozco) family discussing the price of produce. They asked the youngest girl, who was already showing signs of diabetes, what she wanted and she chose pears. She was told, no - they were too expensive. Herald: What would you say to encourage someone to see this film? Jerry Zink: I think people hunger for reality. Holly Zink: It starts conversation, and gets people thinking. Herald: How does this film connect with our local food culture, and particularly the growing support for farmers markets? Redford: This film is for people who really want to know where their food comes from and the process that happened prior to purchasing a wrapped, cellophane package in the store. Nathwani: The film treats us like intelligent individuals. It doesn't dumb down the information, and that's another reason to see it. It also encourages us to take initiative and have responsibility for ourselves. Theatre in Durango through Aug. 6. "One of the most important battles of our time is the right to know what's in our food."